I've always struggled with black and white conversions, often pushing them too far, but thanks to Victor W, I've got a method that I'm pretty happy with. 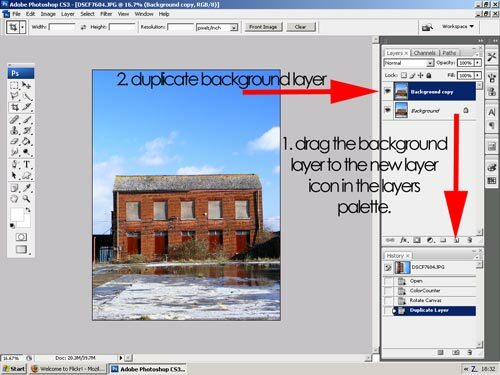 I've put together a short tutorial to explain the method, which works in Photoshop and Elements, and can be adapted to other photo-editing software. You can see Victor's original method here. (My method is a slight variation). The thinking behind this technique is that by converting to pure black and white, (or grayscale), we're limited to only 256 different shades of grey because that's all the data a jpg image can store. By adding a hint of colour, we're introducing a lot more shades of (almost) grey, to give us a little more "elbow room" when editing. 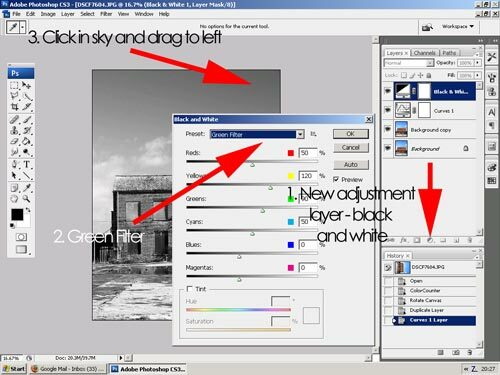 It should help to reduce issues like banding in areas of similar tonal values (like the sky) too. Now it's time to add a black and white adjustment layer. 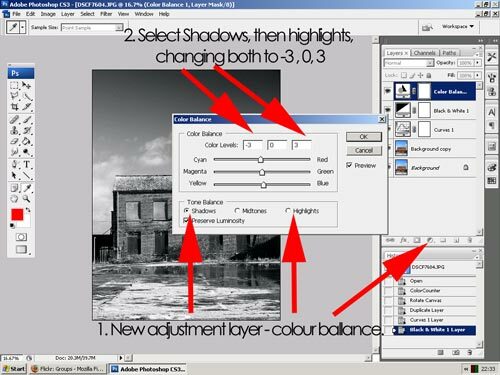 If your version of Adobe Photoshop or Elements doesn't include the b & w adjustment layer, use the channel mixer or hue / sat. 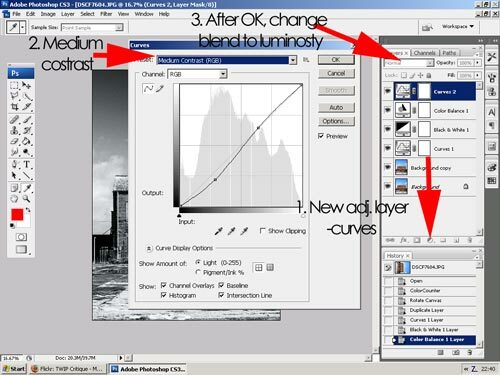 adjustment layer instead. (I've explained these black and white techniques in this article). Now we're going to add a color balance layer. 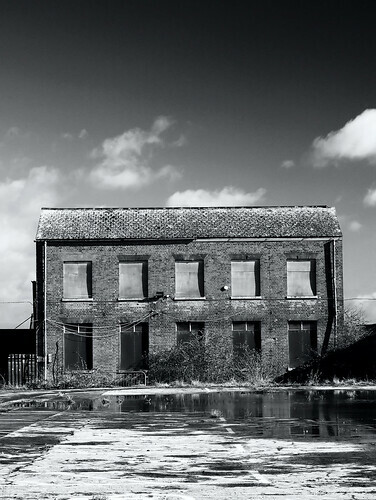 This is the bit that'll change our black and white to one that includes a hint of colour. In this example the photo gets a slightly blue, cold cast, but if you use 3,0,-3 instead, you'll add a slightly orange, warmer cast. Now we're going to punch in even more contrast with a curves adjustment layer. Again, you could use levels instead. Make sure you change the blend mode to "luminescence" so it doesn't affect our slight colour cast. 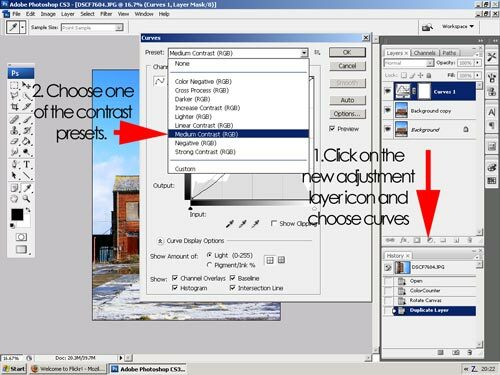 You could really work on the photo by using layer masks to change local contrast in specific areas - check out this post for an easy guide. 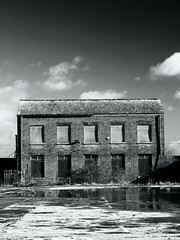 That's it really, so have a play with black and white, add a little colour, and see if it improves your work. 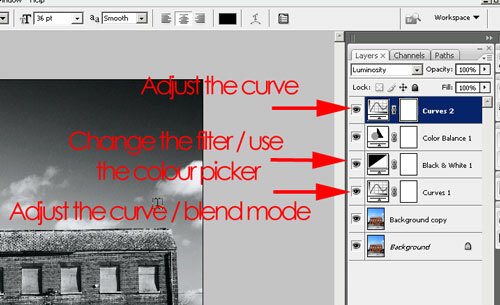 Nice to see a good step by step method rather than the 'blethering' I did.